I’d never played this one before, and I have to be honest, I don’t recall anyone ever mentioning it to me. Looking back, I’m not surprised I missed it; the game debuted in 1992–more than a year after the launch of the SNES–and I don’t think I even had my original Nintendo hooked up any more. Anyway, after spending just a few hours with Yoshi, it seems pretty obvious that Yoshi was intended as a pacifier for players who hadn’t been able to upgrade their console, but who’d heard about Mario’s nifty new dinosaur buddy. Unfortunately, the reason you’ve never heard anyone lament this forgotten Yoshi game is less related to the SNES eclipsing the NES, and more the fault of the utterly forgettable, if innofensive, gameplay. Of the ten 3DS / NES freebees, this one ranks fairly low for replay and general value, well below other simplistic titles like NES Open Tournament Golf. Play for a few minutes, and even the most forgiving fanboys will quickly conclude that Nintendo, reveling in the smash success of Tetris on console and handheld systems, figured they could get away with a slavishly-imitative puzzle title. Yoshi had name recognition and the falling-block genre was at the height of popularity, so why not? A basic Mix and Match. It will take me longer to explain Yoshi’s premise than it will take an average player to get bored with the game. Imagine Tetris, but replace the shapes with a handful of mario sprites. Forget the need to rotate or move the falling pieces into tight spaces. Instead, you’ll have 4 columns that the player shuttles from side to side in an effort to match like pieces together. See the big hook? Instead of moving and spinning weird shapes into orderly patterns, you’re moving the piles instead. The only (and I mean only) variation on this too-simple formula are the Yoshi egg pieces. By placing the two halves of an eggshell in the same column, the player can grab extra points and witness some truly riviting game action . . .wait for it. . . the reunited egg will colapse the enclosed sprites and hatch an animated baby dinosaur. Yep–it’s a cute little Yoshi, right there on your screen. He can’t do anything, he isn’t ridable or going to swallow enemies or help you in any way at all . . . but there he is, the namesake of this wonderful game. Advanced players are encouraged to pile additional pieces inside the egg before hatching another dinosaur, thereby yielding more points and animations of evolved forms of Yoshi (the best one has a star in his hand, hooray!). Maybe I’m the only person who behaves this way, but Yoshi is one of those games where I spent too much time playing it because I was truly trying to figure out what makes it an appealing or good game; I simply kept searching for that hidden spark of Nintendo magic. Know what I mean? It’s that situation where your brain just can’t accept that any self-respecting publisher would put this thing on the market unless there were some redeeming quality hidden deep beneath the surface—you just need to keep digging down deeper to find it? So…in spite of your better instincts, you keep playing it, scouring the game for that mystery X factor that will make you sit up, shout “A-HA, now I get it!”, and keep you hooked for a hundred more hours? Save yourself some time—there is nothing down here to find. No hidden charm or secret unlockable feature is waiting around the next corner. Yoshi is a banal, over-simplistic Tetris-style puzzle game that has little to offer beyond it’s existence as a retro/NES curiosity. 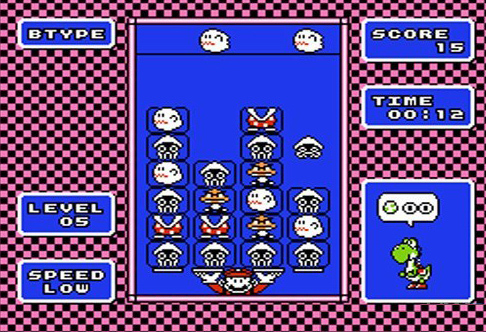 Yoshi could benefit from the eventual two-player update, but I’m left with the same questions that I’ve pondered for the other 2-player NES downloads. Will the two-player mode be restricted to local competitive play, or will the update include online support? The addition of online multiplayer might make for a mildly entertaining experience, though we’re going to have to wait for more details before the jury can reach a verdict. As stated in other reviews, I currently have exactly zero nearby friends who own a 3DS, so for me (and I suspect many other players), online competitive play is the only meaningful improvement that Nintendo could offer for this title. 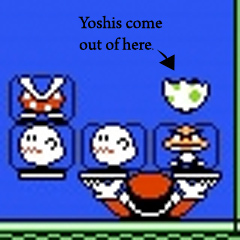 I don’t like being overly harsh, but in all honesty, it would have been better if Nintendo let this overlooked Yoshi game lapse quietly into obscurity. As a collector of classic NES cartridges, I would have eventually found this one on my own (after all, I already paid good money for my copy of the other forgotten NES dino-puzzler, Yoshi’s Cookie), but then I would have only myself to blame. As it stands, I can’t help but suspect the only reason I’m playing Yoshi on my 3DS is because Nintendo promised us the magic number of 20 games, and 20 it shall be, even if they need to pack in a few stinkers alongside the quality gifts.